Christmas Cactus Care - How To Keep Your Holiday Cactus Healthy! Long known for their perfectly timed display of holiday blooms, Christmas cacti are an easy-care houseplant that can add a burst of color to your home throughout the holidays – and beyond! The flat, dark green, pointy edged foliage is a beautiful contrast to the plant’s showy and colorful blooms. Christmas cacti can come in a vast array of beautiful colors. Typically, their blooms can up to and even beyond two weeks. Blooms that can burst forth in a vast array of colors – from red and pink, to yellow , purple and even white. The Christmas cactus plant originates from the mountains of the eastern Brazil coastline. Although the “cactus” name makes one think of dry desert conditions, the Christmas cactus actually prefers high-humidity. Christmas cacti benefit greatly from a monthly dose of all-purpose fertilizer. The foliage grows in a spider-like, segmented fashion. If left to grow, segments can grow as long as two to three feet in length. Blooms typically last anywhere from two to three weeks. 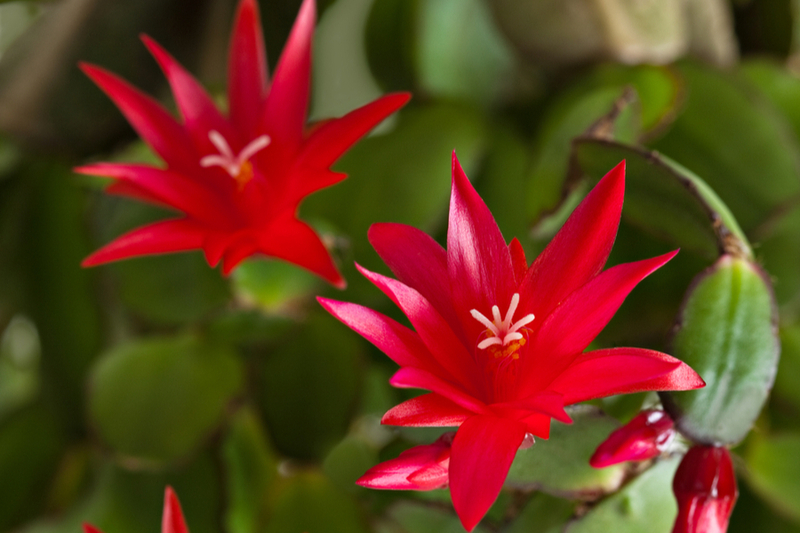 In general, the Christmas cactus is an extremely easy plant to care for indoors. A high-quality general potting or container soil is perfect as a growing medium. Most important is that the plant is kept in a container that can drain easily. Christmas Cacti should be kept in high, natural light areas, but out of direct sunlight. If kept too close to a window with direct sunlight, the tender shoots can actually burn. A Christmas cactus prefers moist, but not saturated soil. Water the plant when the top third portion of the soil begins to dry out. Soak the soil when watering, but be sure to remove any excess water that drains out the bottom. Allowing water to remain in the bottom can cause the roots to actually rot away. Christmas Cacti need to chill a bit after going through a bloom in order to bloom again. One of the best ways to achieve this is to move them to a cool part of the house that is around 50 degrees. A basement, or a closed off winter room are perfect. Keep the soil lightly watered, enough so that the soil feel barely moist to the touch. This will help to force new growth to the cactus. It usually takes about 6 to 8 weeks after new growth appears for plant to form new buds and bloom. Christmas cacti benefit from a little fertilizer now and then. In the late spring, summer and fall, plants can be moved outdoor to a shady location. The best time to prune Christmas cacti is in late June to mid-July. This allows enough time for the plants to put forth new growth and be ready provide Christmas blooms all over again!